Reacting to a news report about MoD officials raising objections to the Rafale deal, former IAF deputy chief S.B.P. Sinha says he’s heard about this only now. 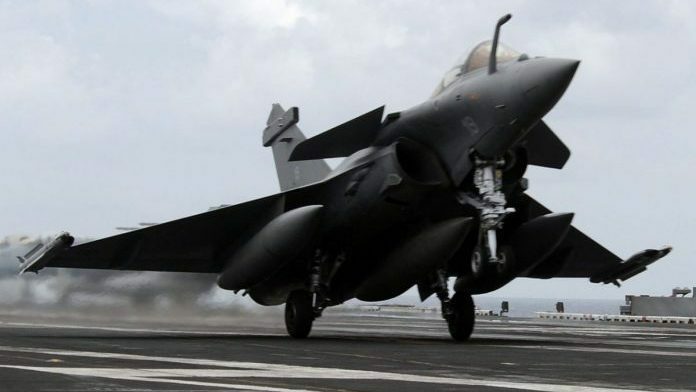 New Delhi: The Indian Air Force officer who led the negotiations for the 7.878 billion-euro deal for 36 Rafale fighter jets said Friday that no one from the Ministry of Defence had raised any objections before his team about any sort of ‘interference’ by the Prime Minister’s Office. The letter sinha referred to was part of documents published by national daily The Hindu Friday, giving rise to a fresh controversy over the Rafale deal. The documents showed that MoD officials, including then-defence secretary G. Mohan Kumar, objected to “parallel negotiations” by the PMO and protested that the position taken by the PMO was “contradictory to the stand taken by MoD and the negotiating team”. Speaking to ANI, Mohan Kumar said the letter had nothing to do with the price of the deal. “It was about sovereign guarantee and general terms and conditions,” he said. MoD sources pointed out that the then-deputy secretary (Air II) who initiated the note was not at all involved in the negotiations. Incidentally, a complete analysis of the file noting shows that Manohar Parrikar, the defence minister at the time, had allayed the concerns of his ministry officials. The Rafale negotiations were being handled by the IAF and not by the bureaucracy, since the negotiating committee was headed by Air Marshal Sinha. Even though the seven-member committee had five joint secretaries from the MoD and its finance wing, no mention of PMO interference was ever raised before Sinha. Sources said the officials wanted a bank guarantee, and this was an issue under discussion. “Bureaucracy goes by precedents. Usually, when a deal is signed with a foreign vendor, a bank guarantee is taken, but in this case it was a government-to-government deal. Even under Foreign Military Sales route with US and in many deals with Russia, bank guarantees were not taken. Here, it was the French government, and we did not want to reduce it to a vendor,” a source said. Sources said Air Marshal Sinha had received a letter from his French military counterpart talking about the fact that the French President’s Office and the PMO were talking about a comfort letter and not a bank guarantee. Following this, the Air Marshal wrote to the PMO wanting to know if such talks were on. The Rafale deal was signed under the Defence Procurement Procedure (DPP) 2013, and Para 71 — which deals with government-to-government deals — says such “procurement would not classically follow the Standard Procurement Procedure or the 15 Standard Contract Document, but would be based on mutually agreed provisions by the governments of both the countries based on an IGA, after clearance from the Competent Financial Authority”. Para 72 of the DPP 2013 says such an inter-government agreement is expected to safeguard the interests of the government of India, and should also provide assistance of the foreign government in case the contract(s) runs into an unforeseen problem. “The comfort letter was exactly for this,” the source said. Defence Minister Nirmala Sitharaman said in Parliament that the PMO periodically enquiring about the progress of the negotiations cannot be seen as “interference”. “Do you think that during the nuclear deal with US, the negotiations were handled by the MEA alone and PMO did not have any inputs or no talks were held?” said an MoD source. The “emergency”, to quickly obtain 36 aircraft has never been explained. If there was an emergency, if Dassault was to provide 36 planes on urgent basis, jumping the queue, then those aircrafts should have started landing by now. That could have also explained paying an extra price. It’s all so intriguing because everyone is trying to detect some logic in the whole thing. We must try to understand a very simple thing: decisions based on ego follow no rationale! In fact, wider off the mark they are from any logic, greater is the satisfaction they impart to the egoist. Ekdam sensational kaam kar diya! “Maine toh unko keh diya hai, buss. Ab aap loag papers taiyyar karwa lijiye please”. This must have been the brief to Raksha Mantralaya. God alone knows what’s going on! This is regarding the first two sentences. To begin, IAF wanted the airplanes 2001 onwards. The MoD delayed and delayed till 2007 when RFP was floated. By the time 126 airplane contest was decided, it was 2012! In the meanwhile IAF fighter strength went down and is still continuing to diminish. Its projected that by 2025 we will have something like only 20-25 squadrons! (Exact numbers and time frame are conjectural). That was/ is the emergency. In the meanwhile negotiations were going S-L-o-w-l-y. The escalation in prices in Euros and the depreciation of the Rupee was going apace. By the time a new Govt took over in 2014, it was abundantly clear that we could never buy the full 126 in one contract. To top it all Dassault would not guaranty HAL-built aeroplanes as fit to perform their combat role. And even Boeing, that makes 3 airliners-a-day does not make 3 F-18’s in a day. So 36 airplanes will require time to build, test and fly to India. And IAF will require to train at least 18-20 pilots to ferry those airplanes. We are NOT buying 36 Maruti cars for Lord’s sake! Inter- ministerial wranglings and difference of opinion are part of any government functioning. This proves nothing. In the previous article of N.Ram, he made invalid conclusions based on wrong arithmetic and logic.,The Rafale debate is moving in round circles and leading nowhere. The 16 th Lok Sabha is nearing its end and formation of JPC is simply not feasible now. Even if Modi loses election, this doesn’t prove or disprove any guilt. In a recent news published in the ET, Dassault has declared that production of components of Falcon jets, which are meant for civil aviation, has commenced in Dassault-Reliance Defence JV plant in Nagpur. The outcry of Anil Ambani manufacturing 36 Rafale planes in Nagpur is a hoax. As reported by Dassault, all the 36 planes will be manufactured in France. Rafale has become only a part of election campaigning, nothing more. This is a hybrid transaction. A Government to Government deal would apply if the IAF was buying from the FAF some aircraft being flown by them. The price could be negotiated, starting from the price paid by the FAF to Dassault, minus depreciation, plus subsequent price increase due to inflation. One presumes this is how things work when MoD buys surplus material from Pentagon stockpiles. Since the Indian government is – effectively – making a payment to the US government, there would be no risk of the money going bad, or non fulfilment of agreed conditions. Hence no need for a bank / sovereign guarantee. Since no one buys second hand 4.5 generation aircraft, the other contingency would be for the FAF to divert part of an existing supply schedule of new aircraft to the IAF, on the same prices / terms as apply to its own purchase. 2. The deal started out as a conventional procurement through global tender. Rafale was selected by a transparent process, by the previous government. Ideally, the on going negotiations ought to have been completed by the successor government. If there was extreme urgency, 36 aircraft were needed to be bought off the shelf, perhaps the negotiations could have been reoriented. In what situation the change in procurement would negate the sanctity of the original tender, giving other bidders a legal grievance, is a matter for experts to discuss. 3. However, how a conventional, by global tender, procurement underwent the chrysalis of a G to G deal is difficult to understand. The buyer and the seller are the same. The specifications and India specific enhancements are laid down by the IAF. Unclear what role the French government plays in such a situation. With India and Dassault having dealt with each other for over forty years, it is not even required as a confirming party. One presumes payments are being made directly to Dassault, not routed through the French Treasury. If the supplier goes bust, unclear if the French Government will reimburse India. Hence their reluctance to furnish a sovereign or bank guarantee, restricting it to a Letter of Comfort. Hopefully, the 36 birds will touch down safely in India, this will not become an issue.